This one is so delicious, it is hard to believe how quickly it comes together. What you need is a little planning,so you have the necessary creme fraiche on hand. You can make your own by mixing 1 cup heavy cream with 2 tablespoons buttermilk, putting the mix in a clean jar, closing the lid and letting the concoction hang out on your countertop for 24 to 48 hours. The rest is simple to assemble and your family will proclaim you a culinary genius. skillet and brown well on both sides, turning once. 2. Transfer the skillet to the oven. Bake for 15 minutes, or until the juices run clear when the chicken is pierced with a knife. 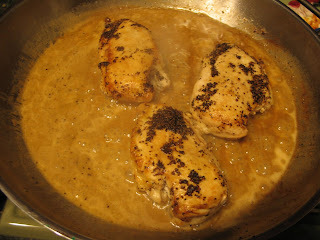 the sauce over the chicken and sprinkle with lemon zest and additional pepper. Serve hot.